Incoming first lady Melania Trump wore a sky-blue cashmere jacket and mock turtleneck dress by Ralph Lauren, the brand that designed so many Hillary Clinton pantsuits, on Inauguration Day. 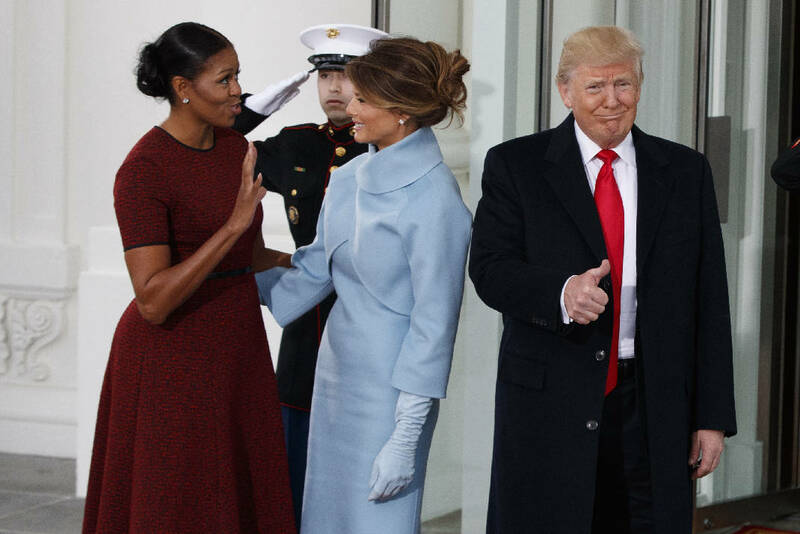 With her hair in a soft updo and accessorized with long suede gloves and matching stilettos, Mrs. Trump was greeted at the White House by President Barack Obama and first lady Michelle Obama, the latter in a red short-sleeved dress. First daughter Ivanka Trump, meanwhile, chose Oscar de la Renta, and Hillary Clinton showed up in a white Ralph Lauren pantsuit that harkened back to the one she wore to accept the Democratic nomination for president at her party's convention in July. Her overcoat matched the ensemble. Who else made a large fashion statement for Trump's big day? His senior adviser, Kellyanne Conway, in a Gucci military-style wool coat of red, white and blue, with two rows of cat-head buttons and a matching red cloche hat. She described her look as "Trump revolutionary wear." Others likened it to uniforms worn in "The Nutcracker" ballet.